Right now, Sea is sitting on the other side of the couch. A moment ago, she turned to me and said, “Time is just whipping by… have you noticed?” And I have. In my mind, it’s the beginning of August and I’m just coming back from visiting my family. In reality, almost two months have passed since then. The end of the summer was filled with all of those things that do make time whip by: more family visits, stressful weeks at work, time with friends. Then there were the things unique to this summer: ultrasounds, putting together a nursery, having our baby shower, taking a prenatal course. And in between all of these things, there somehow weren’t enough quiet evenings to blog about any of them. Let’s start with the baby shower. The baby shower happened a couple of weeks ago, though we had spent months preparing for it. Early preparations had looked a lot like Googling, “how many people to invite to a baby shower” or “should you invite neighbours to your shower”. In truth, a group of our closest friends were doing most of the work– surreptitiously asking us how we felt about particular games or color schemes while remaining otherwise suspiciously quiet. As the date approached, preparations became slightly (significantly) more frantic. Though we weren’t organizing the shower, it was taking place in our home, and there’s nothing like inviting 30 or so people over to make you realize how much cat hair has accumulated under and on every piece of furniture you own. As we worked to conquer the dust bunnies, we also had to face another reality: both of our mothers would be coming into town for the shower. 10+ years into my relationship with Sea, this would be the first meeting of the parents. Our parents arrived a couple of days before the shower. The introduction was difficult, quickly going from cordial to rocky. Though the details are best saved for their own post, they resulted in my mother walking out in tears three hours before the shower. Which consequently led to me sitting in our bedroom in tears three hours before the shower. 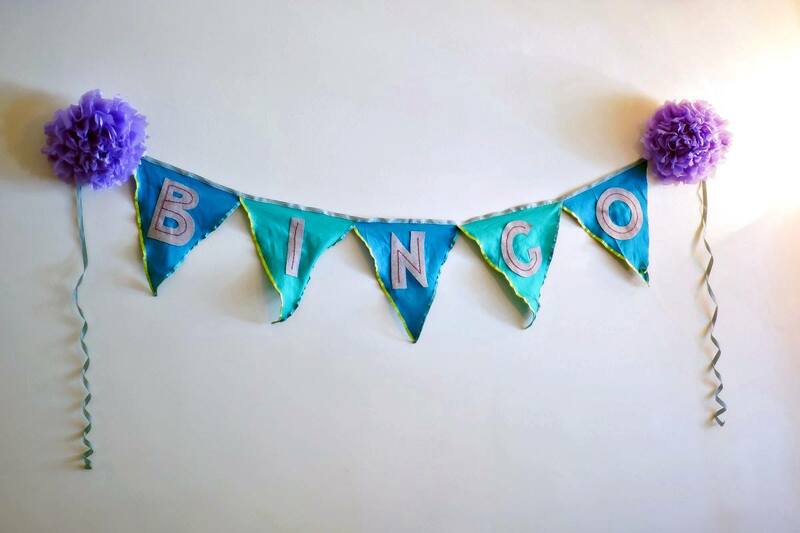 Luckily our friends arrived soon after, with enough food to feed three times the number of people invited, carefully crafted tissue paper pom poms, and the most beautiful handmade felt Bingo bunting. More importantly, our friends brought energy, good humour and much needed distraction. Hearing them laughing and moving furniture downstairs, I wiped up my hormone/family fueled tears and went to help with the final preparations. By the time our guests arrived, my mother had reappeared (pretending that nothing had happened) and our house had been totally transformed. 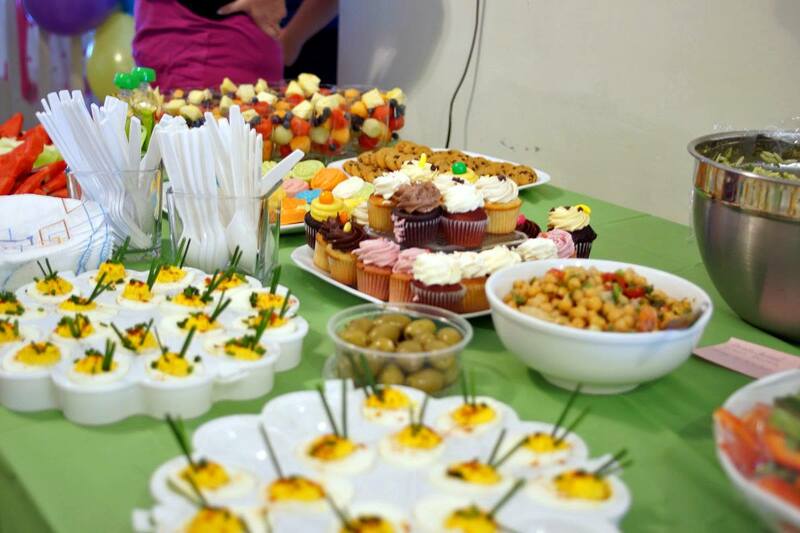 Streamers and brightly colored balloons hung everywhere, music was playing, and the table was covered in carefully prepared food. The party was on. Sea and I both kind of hate traditonal baby shower games (poking at chocolate melted into diapers, guessing at the pregnant person’s circumference…), and our friends had thankfully respected our veto. So most of the shower felt a lot like a fantastic but non-baby related party: good friends crowded into a too small space, constant conversation, excitement every time somebody else walked through the door. I tried to talk to talk to as many people as I could, while attempting not to trip over the surprising number of toddlers and children who had somehow appeared in our usually child-free home. Only two games had been allowed: a “guess the baby photo” game, where guests had to match the posted baby photos to the adults in attendance (suprisingly challenging) and baby shower bingo. As I’m sure you can guess, the latter was permitted only because the name fit. Sea and I unwrapped a shocking number of gifts: some from our registry, some not, all carefully chosen and much appreciated. My mother sat next to us during the unwrapping, commenting on which gifts she considered either particularly good or entirely unneccessary, while Sea and I tried to “ooh” and “ahh” at a loud enough volume to keep her comments muffled. The strangest gifts? Probably the stuffed seagull or the surprising number of New Jersey themed things (onesies, books) from multiple people. Please note: we do not live in or near New Jersey. The most treasured gift? 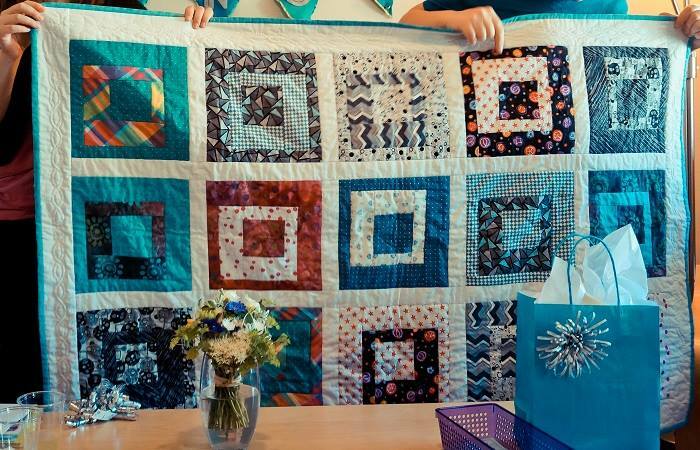 A gorgeous quilt, hand embroidered by Sea’s grandmother. Much like the end of the summer, the baby shower whipped by. Almost as soon as it had started, it seemed, people were waving goodbye and wishing us luck. As the last few guests left, Sea and I escaped up to Bingo’s room with the friends who had organized the shower. I don’t remember how long we stayed in the room or what we talked about, but I do remember a lot of high fives. Before we left, our tallest friend took the beautiful handmade felt Bingo bunting and hung it above the crib.